The Toronto Maple Leafs got more than they bargained for when they visited the not-so-friendly confines of the Wachovia Center in Philadelphia on Wednesday. The Flyers scored early and often against the travel-weary Maple Leafs, beating them 6-2 as center Danny Briere scored twice to reach the 500-point plateau. The Maple Leafs, who beat the Florida Panthers 3-2 at the Air Canada Center the previous night, were no match for the Flyers, who snapped a four-game home losing streak. There was plenty of animosity from both sides, with the game featuring five fights and a total of 80 minutes in penalties handed out. Toronto's Jamal Mayers was the busiest of the combatants, participating in two separate bouts. He fought the Flyers' Ian Laperriere in the first period, then battled Daniel Carcillo in the third. Garnet Exelby of the Maple Leafs and Scott Hartnell of the Flyers each received game misconducts in the final period. Leaf heavyweight Colton Orr, involved in a few altercations and jawing matches with several Flyer forwards, received only a two-minute roughing minor against Mike Richards late in the second period. The bad blood shown by both teams brought back memories from the mid-1970s when the Flyers, known affectionately around the NHL as the Broad Street Bullies, used rough and tumble measures to intimidate their opposition. Philadelphia led 2-0 following the first, increased it to 3-0 after 40 minutes, and outscored Toronto 3-2 in the third period for the 6-2 victory. 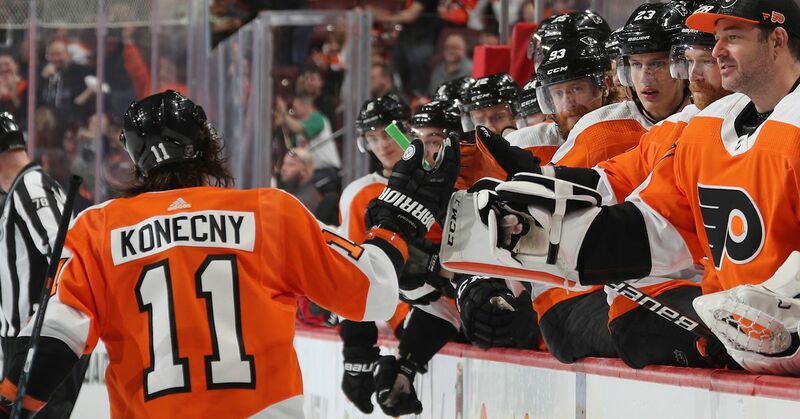 Danny Syvret, James van Riemsdyk, Richards, and Carcillo also scored for the Flyers, who improved to 20-19-3. Defenceman Chris Pronger, selected to the Canadian Olympic Team last week, chipped in with three assists for Philly. Nikolai Kulemin and Alexei Ponikarovsky replied in a losing cause for the Maple Leafs, who fell to 15-20-9.